Catching a striper can be a real thrill. This species of bass are known for growing very large. Fishers on our guided striped bass fishing tours have caught beautiful stripers weighing up to 47 pounds. The largest striper caught in the world was 81.8 pounds. This fish is such a fun sport fish because it is so unpredictable. The right equipment: Our guided fishing tours include all the equipment you will need. The only thing you need to bring is the proper attire, food and drinks. The right equipment for catching a striper includes a good fish finder. This is an electronic device that will detect the depth of water and location of fish around the boat. Striped bass are usually found at deep levels. At times they will surface feed as well. The fact that stripers are so unpredictable only adds to the fun of reeling in a big catch. A sturdy reel that can pull in a large 25 pound fish is best. We use 10 to 20 pound test monofilament line or stronger for these particular trips. The right bait: Here in New Mexico freshwater, striper fishing bait includes lures and live bait. At Elephant Butte, we like to troll with live shad because it has proven fruitful. At times we will use lures as well. We like to use soft plastic swim shad because they look realistic with a lifelike eye and a real weight. The right methods: At times we will use jigging as well which is another method that you will learn on our guided tours. Jigging is a labor intensive method that takes a lot of work, but can be fun. Once you learn it, you will only get better at it! Cleaning and packaging your catch: Learning to clean and package a good catch isn’t for the faint or squeamish. We will show you the best method for getting the fish ready to eat and how to pack them for transport. If this is not something you are interested in learning, we will simply do it for you! The more you know about a species of fish, the more you will understand how to catch it. 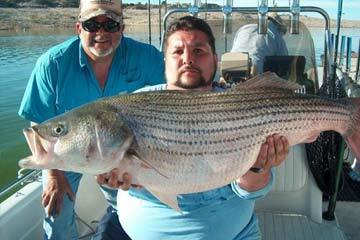 The trouble with striper fishing in Elephant Butte is the fact that stripers are unpredictable fish. They can be caught year around, but fall through early spring is the best time to catch them because of water temperatures. Stripers naturally migrate to freshwater spawn. This is because their eggs must be in constant motion to hatch. This is how they populate the lakes. 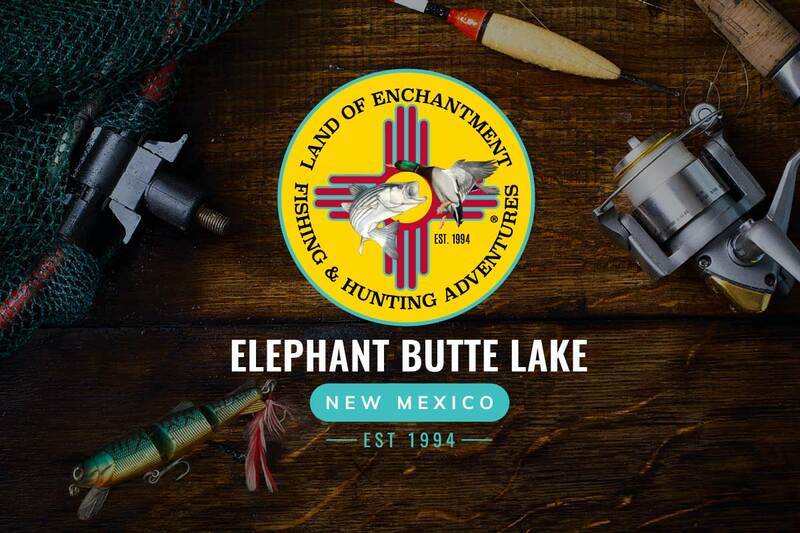 Elephant Butte was also stocked in May with 20,000 fingerlings and August with 40,000 of 2015 by a group of volunteers. The lake was also stocked with over 100,000 bass in 2016. Freshwater striper fishing can be difficult, but there are many techniques that work. If the water is clear, an increase in speed will trigger strikes from stripers. The faster movement will keep the bass from looking over the lure too much. A quick retrieve will also perk their predatory instincts. This is a good method for artificial lures. The best bet is to use lures that maintain a realistic swimming action. Lures that spin too much are not good for catching stripers in Elephant Butte waters. Catching a striper in deep water means trusting your fish finder. Deep water bass usually don’t feed so they don't swim very far to chase a bait. We usually slow down the trolling for deep water. We try to move at the same speed as the current so that the lure or live bait will appear more realistic. The line should be just about vertical and the bait should be near the bottom. Too much scope means the bait will only drag and you will get snags but not hits. If you think catching a striper is exciting, you will truly enjoy freshwater striper fishing at night. At night, the fish change their tactics so your daytime fishing techniques just won’t work the same. It is best to stay near the shallows at night because they hang around these areas looking for an easy meal. In the springtime, the stripers spawn in channels, so these spots are great at night in the spring as well. Sound is louder at night due to the cool air so keeping calm and quiet is a must. Striper fishing at night will get you nothing if you don’t know what you are doing. However, on one of our night fishing adventures you will learn the techniques you need to successfully catch plenty of fish.